Flexi4 provides a new and completely unique approach to equine joint health. Flexi4 is an oral apple flavoured gel which is to be fed once daily. 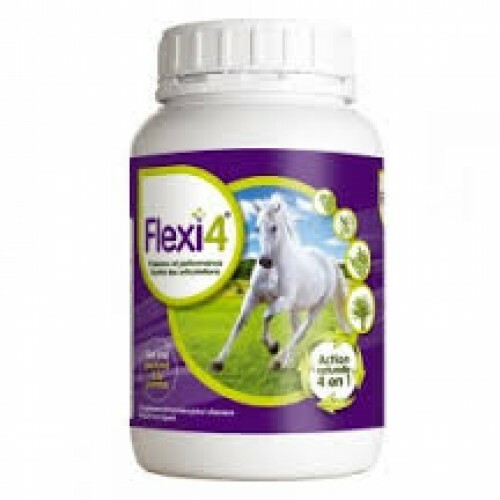 Flexi4 contains a patented combination of plant extracts and acts as anti-inflammatory, anti-pyretic and analgesic properties and it does not contain any substances listed as prohibited by the FEI. Flexi4 contains a blend of four carefully selected plant extracts, Curcumin, Yucca schidigera, Salix alba and Boswellia serrata, that have been shown to have anti-inflammatory, anti-pyretic and analgesic properties. Curcumin, an extract from the roots of the herb Curcuma longa, has been shown to down-regulate inflammatory pathways and inhibit the production of inflammatory cytokines. It has also been shown to significantly reduce the release of GAGs from the cartilage matrix. Yucca schidigera is a botanical extract, rich in saponins that suppress the intestinal protozoa, which are thought to have a role in joint inflammation in some circumstances. The extract also contains antioxidant polyphenols, which inhibit the enzymes of the arachidonic acid cascade, thereby reducing the production of inflammatory mediators. Salix alba is an extract of white willow bark containing salicin, polyphenols and flavonoids. These are reported to have a positive effect on chrondrocyte viability, differentiation and function as well as anti-inflammatory, anti-pyretic and analgesic properties. Boswellia serrata is the botanical extract of gum resin. Its role is to inhibit the pro-inflammatory cytokines and mediators which initiate the inflammatory process and produce anti-inflammatory activity at sites of chronic inflammation. Competition horses : 50 ml per day for 20 days , in particular during periods of ontensieve labor. Horses with joint problems : starting dose of 100 ml per day for 20 days followed by a maintenance dose of 50 ml per day for two months . This dosage regimen may be repeated several times per year . Older horses : 50 to 100 ml per day . Both the administration period and the amount administered should be tailored to the individual horse .